Indian bike market is growing at a very fast pace. With the growing number of motorcycles in the market, many new bike buyers get confused between numerous choices. The new generation of bike lovers is opening up to buy the bikes of their choices be a sports bike, cruiser, adventure or any other, moving away from the traditional set of two wheels. Best bike under 2 lakh. Top bikes in India. In the new era, the two-wheeler companies are adapting well and have introduced a variety of affordable bikes including the sports bikes in India. Many of them are quite expensive while some of the manufacturers offer affordable, value-for-money sports bikes. 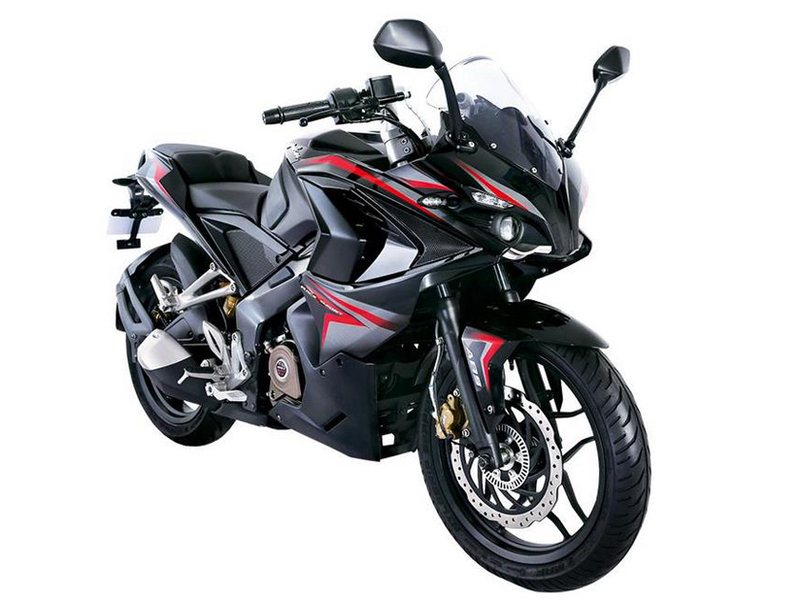 We bring you 10 such latest sports bike in India under 2 lakh that will fall in your budget. Here are ten best bikes below two lakhs in India. Suzuki launched premium commuter motorcycle Gixxer in the market and then followed up with the fully faired version of the same. The Gixxer SF was launched as the Suzuki’s first fully faired motorcycle in the affordable segment. The Suzuki Gixxer SF is a well-packaged motorcycle and looks fairly good too. The full body fairing on the Gixxer looks very well-proportioned. The headlamp of the motorcycle resembles the flagship GSX-R1000. Suzuki’s 1-into-2 exhaust gives the motorcycle a throaty exhaust note. This Suzuki motorcycle is also very well balanced to ride around. Suzuki offers a fully digital console with the Gixxer SF and a very well sculpted tank. The motorcycle is powered by a 154.9cc engine that generates a maximum power of 14.6 Bhp at 8,000 rpm and 14 Nm of maximum torque at 6,000 rpm. It comes with a 5-speed gearbox. The riding position of the Gixxer SF is very relaxed, and it can be used for highway rides as well as city rides without any discomfort. It comes with 12-litre tank and can touch a top speed of 127 km/h. Suzuki offers the rear disc brake as an option, but there is no ABS offered with the motorcycle. By all reasons, this bike is in our best ‘bikes under 2 lakhs’ category. Mahindra launched the Mojo as a unique offering in India. 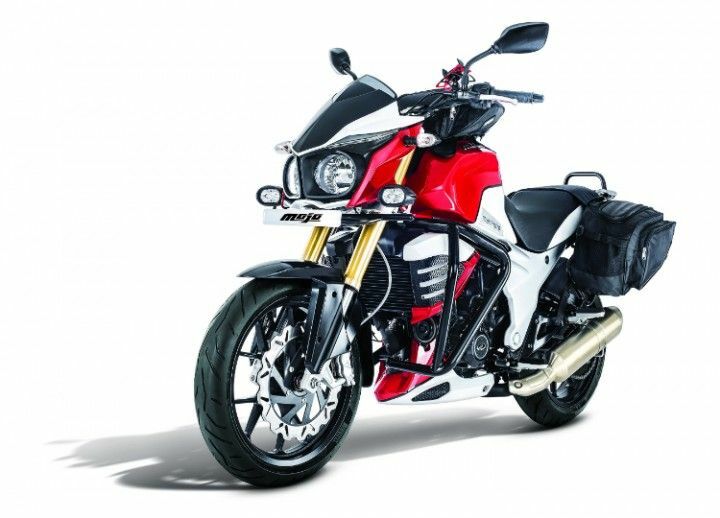 The Mojo is Mahindra’s flagship and is a touring motorcycle with a sporty feel. The motorcycle gets a unique 1-into-2 exhaust. The motorcycle is powered by 295cc single-cylinder engine that produces a maximum power of 26 Bhp at 8,000 rpm and 30 Nm of torque at 5,500 rpm. The Mojo comes with twin-pod headlamps and Pirelli Rosso tyres that give it decent grip in the worst situations. Mahindra launched Mojo in “Bike under 2 Lakhs” category. Finally Honda comes with new Honda CBR 250R. Last year CBR 250 had to be phased out due to BS3 engine. But now new updated version of CBR 250R is more stylish and new color schemes also but the power figures are same as previous model. Now it has LED headlight and ABS version also present. It has 249cc liquid-cooled single cyclinder engine with PGM-Fuel injection that generates 26.5 bhp and 22.9Nm of torque and its top speed is 135kmph. This is one of best Honda bike under 2 lakh in India. Benelli, an Italian manufacturer, has slowly grown in India’s affordable performance motorcycle market. 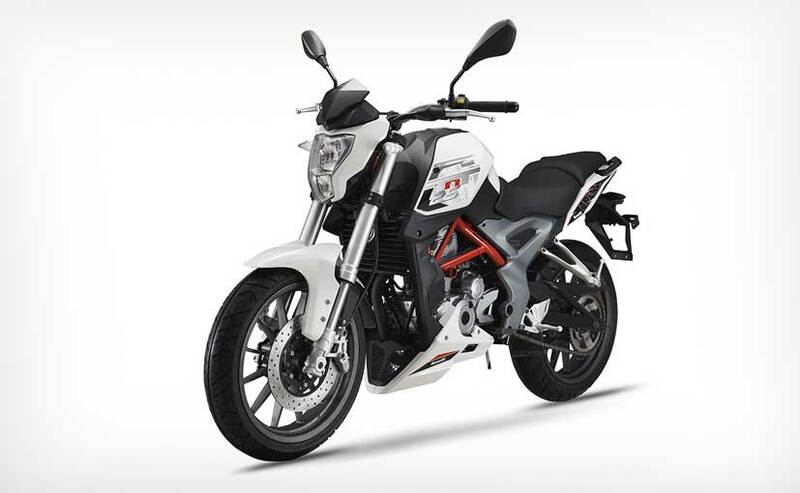 The Benelli TNT 25 is the entry-level Benelli in India. It is a street fighter with very aggressive looks. The TNT 25 gets exposed trellis frame of red colour. The motorcycle also gets upside-down telescopic forks at the front while there is a mono-shock at the rear. The TNT25 looks very smart and offers a lot of styling within a limited budget, and now this is in our top10 bikes under 2 lakh category. The Benelli TNT is a single cylinder motorcycle. The liquid-cooled 249cc engine churns out a maximum power of 28.16 Bhp at 9,800 rpm and 21.61 Nm of peak torque at 8,000 rpm. The TNT25 is adequately powered to be taken on the highways, and the riding position too is not very aggressive. The motorcycle gets disc brakes at both the wheels and ABS is not available even as an option. The motorcycle gets 17-litres of a tank and a claimed top-speed of 145 km/h. The Benelli TNT25 is available in two colours, Rossi red and Bianco white. 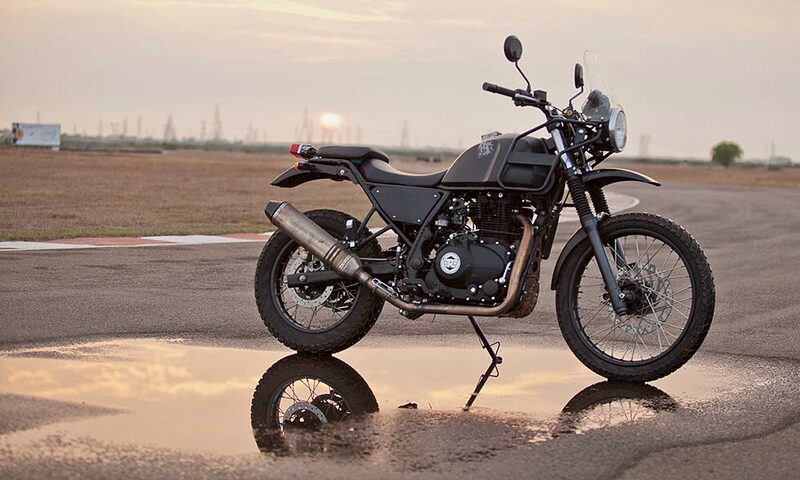 The Royal Enfield Himalayan change the dynamics of the Indian motorcycle market after it was launched. It is the most affordable adventure motorcycle that anyone can buy right now. The motorcycle is powered by 411 cc, four-stroke liquid-cooled engine that produces a maximum power of 24 Bhp and 32 Nm of torque. The Himalayan comes with a lot of standard features like the onboard compass and a very suitable riding position. There are also standard rails for attaching fuel cans and luggage on the Himalayan. Himalayan gets a ground clearance of 220mm, allowing riders to cross deep water crossing with ease. With all the qualities, the Himalayan is one the 'best bikes for road trips in India'. 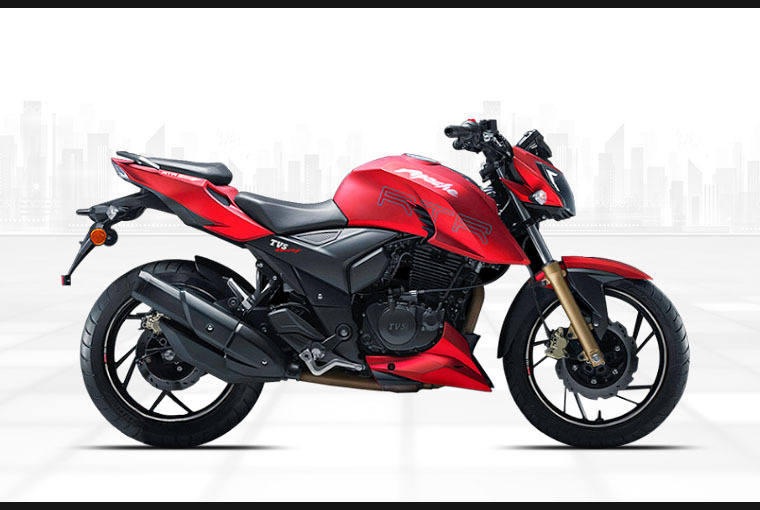 TVS Apache RTR 200 4V is the current flagship bike of TVS. The aggressive styling of the RTR 200 4V comes from the Draken X-21 concept. TVS, one of the known Indian companies that are very active in the motorsport division has developed the RTR 200 4V on the race track. The Apache Race Throttle Response (RTR) is a street fighter that looks extremely proportionate. The single pod headlamp unit gets a LED DRL that serves a the AHO. This TVS motorcycle gets split seats and aggressive riding stance. The RTR 200 4V gets an all-digital console that shows a lot of information and clear reading of speed. The console also shows the highest speed achieved and the lap time too. There is a speedometer, odometer, two trip meters, gear indicator, gear shift light and service reminder. This is Yamaha’s latest launch in the market and is one of the best sports bikes below 2 lakh. Yamaha entered the 250cc market in India with the FZ25. After the grand success of the FZ nameplate in India, Yamaha launched the 250cc naked motorcycle with the same brand in India. The late entrant in the 250cc segment, Yamaha has made sure that the price tag set right. The FZ25 has some distinct similarities with the FZ 2.0. The motorcycle comes with huge, muscular tank with deep creases on the side. The headlamp unit is an all-new LED unit that gets the Always Headlamp On (AHO) feature. The tail lamps are also full-LED. The motorcycle gets futuristic handlebar and split seats. The motorcycle gets 282mm twin-caliper disc brake at front and 220mm single-caliper disc brake at the rear. The FZ250 is powered by 249cc, air-cooled plus oil-cooled, single-cylinder engine that generates a maximum power of 20.4 Bhp and peak torque of 20.4 Nm. Fuel is supplied through fuel injection system, and the motorcycle is BS IV compliant. The FZ25 is the most affordable and yet very stylish choice in latest ‘bike in India under 2 lakh’ segment in India. Bajaj Pulsar RS 200 was first showcased at the Auto Expo of 2014, and many onlookers were intrigued by the new design of the motorcycle. The Bajaj Pulsar RS 200 was launched later in 2014 and received a lot of pre-launch bookings. The RS200 is the fully-faired version of the Pulsar NS200. The Pulsar RS 200 carries a unique design and gets a layered fairing. It also gets dual headlamps with projector bulbs. The RS200 is powered by 199.5cc liquid cooled engine derived from the KTM 200 Duke’s engine. It generates a maximum of 24.5 Bhp and 18.6 Nm. The engine gets Bajaj’s revolutionary 3-spark plug technology that ensures proper burning of fuel and increases the performance and the efficiency of the motorcycle. The RS200 is the only fully-faired motorcycle from Bajaj. This bike is from Bajaj, so it is least maintenance free “best bike under 2 lakh” category. 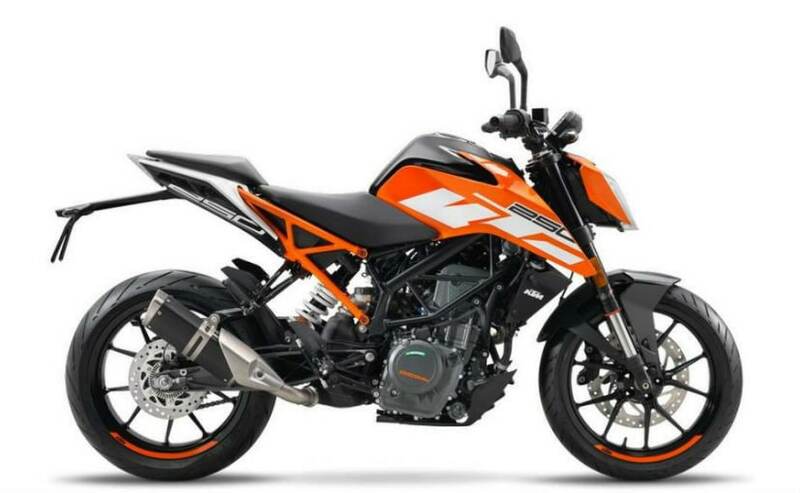 KTM launched the 250 Duke as a surprise in the Indian market. The KTM 390 Duke looks almost similar to the 250 Duke and can only be differentiated by the colour of alloy wheels and the trellis frame. Both the frame and the alloys are black in colour as against the orange colour of the 390 Duke. KTM says that the 250 Duke is the smaller package of the 390 Duke and in the true sense, it is a smaller package. It looks sharp and is available in two colour options - Orange and White. The 250 Duke, however, does not get the high tech and advanced features of the 390 Duke. The motorcycle gets halogen lamps instead of the LEDs, but the headlamp housing remains the same. The console is similar to the 200 Duke, and there is only an LCD screen instead of a TFT. The 250 Duke is powered by a 250cc, single-cylinder, liquid-cooled engine that generates a maximum power of 29 Bhp and peak torque of 24 Bhp. The Duke 250 also gets slipper clutch, making it the first motorcycle in the segment to get slipper clutch. The 250 Duke is one of best sports bike under 2 lakh in India with its aggressive styling, and the potent engine is one of the best choices in the market. 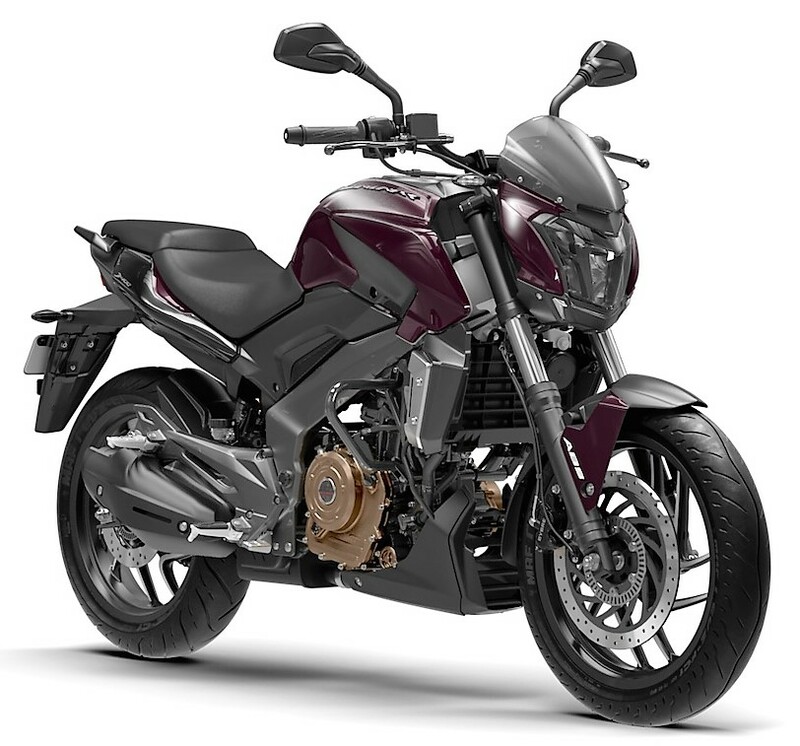 Bajaj, for a first time in a long time, replaced the flagship model, Pulsar by introducing the Dominar. The Dominar was first showcased at the Auto Expo 2014 as Bajaj CS 400. The naked, long touring motorcycle is the most powerful Bajaj bike in the market. The motorcycle gets LED headlamp cluster with AHO feature. It gives the motorcycle a unique look. The motorcycle comes with 13-litre tank with bikini fairing making it look very stylish. The Dominar 400 also comes with reverse LCD that provides extremely clarity during day and night. The Dominar 400 is powered by the 373.2cc engine derived from the KTM 390 Duke’s engine. It generates a maximum power 34.5 Bhp and maximum torque of 35 Nm. It comes mated to a 6-speed transmission. The motorcycle returns a maximum fuel efficiency of 35 km/l. This is the only 400cc bike under 2 Lakh. This is the List of Top 10 Best "bikes under 2 Lakhs" or "best bike in India under 2 lakh" in India. Please keep sharing and commenting.